It seems like the threats to our Bad Lands never cease. Let’s go back and revisit Wylie Bice. He’s the rogue rich rancher up in Dunn County, on the eastern edge of the Bad Lands, who’s built himself a private bridge on public land, without permission, over the Little Missouri State Scenic River. Now it appears he is going to get away with nothing more than a slap on the hands and a little dip into his very big pocketbook. I’ve written about him before. 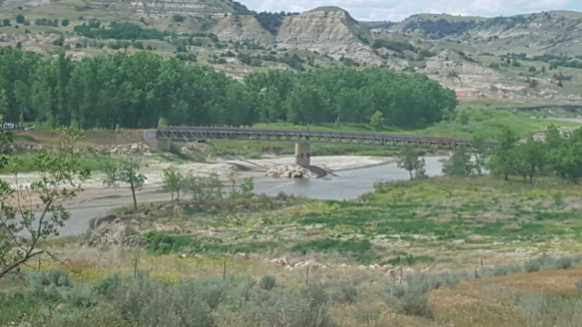 After making a fortune in the oilfield trucking business, he bought a neighbor’s ranch across the river from his and then spent a lot of money — maybe as much as a couple of million dollars — on a fancy bridge to get back and forth. The only problem is he built it on land owned by the Bureau of Land Management (a federal agency charged with managing some of our federal lands), figuring it was easier to say he was sorry than it was to ask for permission. Boy, was he right. An aerial view of the Wylie Bice bridge and his water depots. Federal land on the left, private land on the right. Ironically, the BLM didn’t even know the bridge was there until I wrote about it on this blog a couple of years ago. That’s when the BLM sprang into action. Once it found out about the bridge, as well as an industrial water depot, a road and an alfalfa field, the BLM charged him with trespassing and began a process to determine what to do about it. The process was to conduct a formal Environmental Assessment to see what damage he had done and how it might be corrected. The first draft of the EA is done and it’s out for public review. You can go to the BLM website to look at it if you want. It outlines five possible scenarios ranging from tearing down the bridge to swapping land with Bice so the bridge would no longer be on public land. At the very outset of the plan, the BLM said it had “eliminated (the land swap) from further examination,” and then in the next breath said, “the BLM remains open to a potential land exchange for this area” sometime down the road. Yeah, that’s weird. And suspicious. But I found something weirder, which kind of explains that. I sent an e-mail to the BLM asking who actually wrote the EA, and who was paying for it. The BLM wrote back that the way it works is Bice actually hires an engineering firm to do the EA, it writes it, sends it to the BLM, which edits it and publishes it. Huh. A bit like the fox guarding the hen house, it seems to me. In other words, the BLM proposes to let Bice keep his bridge, tear out his water depot, seed his alfalfa field back to native grasses and then slap a fine on him for doing all that. He probably spent a couple of million dollars on that bridge, so the BLM is not going to make him tear it down. The BLM has accepted the engineering firm’s recommendation and has sent out a press release saying the Draft EA is done and there’s now a comment period open until April 24, for those of us a little concerned about this, to let the BLM now how we feel about its recommendation. I think I’ll just send the BLM this blog as my comment. I’m probably about as stirred up about this as I am going to get. Here’s why. To repeat and summarize: The bridge stays, the road stays, and Bice gets fined for not getting the right-of-way permit BEFORE he built the road and the bridge. “5) In addition to these civil penalties described in No. 4, if the responsible party is noncooperative, they may be tried before a United States magistrate judge and fined no more than $1,000* or imprisoned for no more than 12 months, or both, for a knowing and willful trespass, as provided at 43 CFR § 9262.1 and 43 U.S.C. § 1733(a). Well, that’s pretty straightforward. The BLM said it would calculate the fine when the Draft EA becomes final and let me know how much the total is. But item 5 is interesting. It says if Bice is not cooperative, he could be fined up to $100,000 and go to jail for a year. The BLM tells me Bice is being very, very cooperative, so those drastic measures won’t be taken. No surprise there. The dude has deep pockets and will pay any fine necessary for him to get to keep his bridge. Wylie Bice’s pretty nice — and illegal — bridge over the Little Missouri State Scenic River. Photo taken from the east side (yes, I might have been trespassing, but just for a couple of minutes). That’s BLM land across the river. In fact, he can probably sell enough water to pay for that bridge. And don’t be surprised if some day, a few years from now, a land swap takes place and Bice trades a hundred or so acres of his ranchland somewhere out in the boonies of Dunn County for the hundred acres or so the bridge sits on. And puts his other water depot back in. And then he can REALLY sell some water. And there are a bunch more ranchers out there who also have water permits and water depots, ever since the Legislature and Gov. Doug Burgum opened the river up to industrial development in 2017. We complained about that back then, and asked Gov. Burgum not to do that. Probably wouldn’t take too many truckloads of fracking water for them to pay for bridges across the river at their places, too. Pretty soon the Little Missouri State Scenic River Valley becomes an industrial corridor. That’s the danger we warned the governor about when he established the policy of using Little Missouri State Scenic River water for fracking, to accommodate the oil industry. There are no firm dates set for any further action by the BLM, except the April 24 deadline for submitting comments. My guess is it will move pretty fast (for government), so Bice can get the water pit out of there this summer and get native grass seeded in place of the alfalfa. Thanks for your vigilance Jim. These guys are like water torture–unrelenting. They squeeze and squeeze. If they’re selling water for fracking that comes out of the Little Missouri, what are they paying for the water? I agree that the bridge in question looks a lot more like it was built to carry heavy trucks than cars and farm machinery. Any rent should be based on the value to an oilfield-related enterprise, not on comparable rentals for farming use. Let me get this straight. A “land swap” is no longer under consideration but a “land exchange” is still possible. What is the difference? How do these bureaucrats get away with such semantic doubletalk? And he got to write his own EA??? What are we paying the BLM guys for? Could this bit of nonsense be cause for a lawsuit? This is a private taking of a public resource and public land. Got that right PUBLIC land and resources used for someone’s private business Seems to me THAT in itself is enough for a law suit, but get the Government to respond?? probably not. Any private citizens with deep pockets to foot the bill? I can make noise but pockets are lined with lint. darn it! !